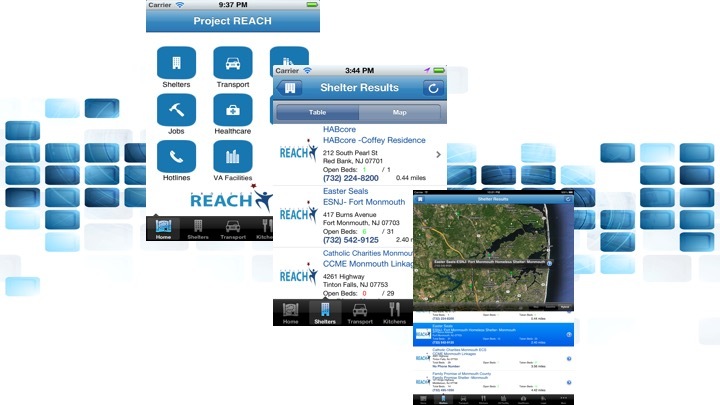 Project REACH was a VA and HUD Innovation Challenge that was co-sponsored by the Jon Bon Jovi Soul Foundation. The aim of this project was to develop a tool that would enable caregivers to access geo-localized information about nearby services available for the homeless. These services included finding nearby kitchens, medical care, shelters, and legal services. Our founders co-developed the winning solution for this challenge by quickly developing an expandable mobile application for Android and iOS platforms connected to a cloud based resource database that was able to mine, normalize, and geo-encode addresses and information about services making this information available to caregivers on their mobile phones and through a dynamic website. The solution was developed and demonstrated within 3 weeks of the announcement of the contest, and by the end of the competition the platformed had mined and made available information available across the United States. The application was announced the winner of the contest in April 2013 (here) and was further recognized as an innovative solution for using place data for solving a social issue by Google in 2014 and also by the Defense Strategy Initiative for Innovative Mobile Application.